Bissonnette flew over 200 missions as a Republic P-47 Thunderbolt pilot, earning the Distinguished Flying Cross and Air Medal with three Oak Leaf clusters. Keith F. Bissonnette was born in Enderlin, North Dakota, a picturesque town in the rural southeastern part of the state. His father, Jesse, a former Dakota League ballplayer, moved the family to St. Paul, Minnesota, when Keith was still young. Bissonnette was a pitcher in grade school, but he was such a good hitter he was switched to the infield to get his bat in the line-up every day. At Cretin High School in St. Paul, a private Catholic school, now known as Cretin-Derham Hall High School, he was a first baseman for four years and the bulwark of the school team. Bissonnette never hit below .400, led the team in hitting twice, and blasted a 420-foot home run in the scholastic play-off championship in his senior year. But his athletic prowess was not limited to baseball. Bissonnette also played hockey and basketball in high school and was a standout football player, making the St. Paul all-city team as a fullback. "[He] would probably have won football fame in the Big Ten conference had he chosen to follow the grid sport into college," the press reported at the time. 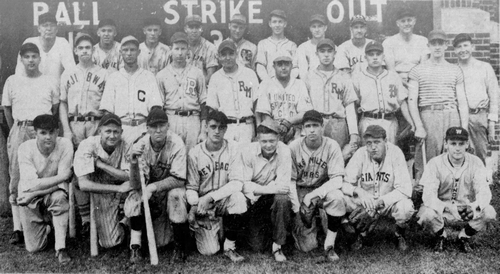 Baseball was Bissonnette's first love and in the late summer of 1939 he was playing in the local amateur league when he signed with the St. Paul Saints of the Class AA American Association. At the time, local scouts rated him as "one of the best to ever come out of this area and a definite major leaguer." In March 1940, Bissonnette traveled south with the Saints to their spring training home at Venetian Gardens in Leesburg, Florida, home of the Class D Florida State League's Leesburg Anglers. When the Saints' regular season opened, he remained in Leesburg as the Anglers' starting first baseman. The Leesburg Commercial reported how the 19-year-old began his rookie year in style by leading off the third inning of the season opener against Gainesville with a home run, "sending the ball in a line drive that cleared a five foot fence in leftfield 365 feet from home plate." When the first half of the season concluded in June, Bissonnette was batting .288 and had played in all 68 games for the fourth-place club, prompting Bernard Kahn of the Daytona Beach Sun Record to select him and three other Leesburg players for the allstar team. A hot streak to open the second half of the season - two hits against Daytona Beach on June 27, two hits against DeLand on June 30, two hits against Ocala on July 1, and a further two hits against Gainesville on July 4 - saw his average quickly climb to .297. But as the summer wore on his average dropped and Bissonnette finished the season batting .277 with 67 RBIs in 134 games. With his rookie professional season behind him, Bissonnette left Leesburg the day after the season ended and returned home along with teammate and fellow St. Paul resident Eddie Hoffman. Both players got into a handful of games for the Saints before the American Association season ended (Bissonnette had three hits in 20 at-bats over five games). He spent the winter months working in the local post office while Hoffman took an off-season job with an envelope manufacturing company. Bissonnette started the 1941 season with a new team and a new fielding position. Playing second base for the Utica Braves of the Class C Canadian-American League, he was batting .286 after 32 games and was optioned to the Augusta Tigers of the Class B South Atlantic League. He played 91 games for the Tigers as an outfielder/first baseman and batted a solid.291 with 36 RBIs. Among his teammates on the club was Ralph Houk, who would later serve with the 9th Armored Division in Europe before joining the New York Yankees, and Bill Sarver, who would serve with the 3rd Armored Division and lose his life in Germany in April 1945. In 1942, Bissonnette married hometown girl Dorothy Johnson, and celebrated by tearing up the Class B South Atlantic League with the Jacksonville Tars. He batted .326 in 59 games and spent the second half of the season back with the St. Paul Saints. Appearing in 42 games, he played the outfield, first base, third base and shortstop, and batted .237 with 19 RBIs. In his last professional game on September 7, 1942, he went 0 for 4 while playing right field in a 7-0 win over Minneapolis. "Keith Bissonnette, young infielder of the St. Paul American Association Saints ... reported to the Army Air Forces last week," announced The Sporting News in February 1943. "He passed his cadet examinations last summer." Bissonnette had been called for military service on August 5, 1942, and chose to serve with the Army Air Force as a pilot. He began training in February 1943, and by the end of the year he had earned his pilot's wings and a commission as a lieutenant (becoming the first St. Paul player to earn a commission). Keith and Dorothy's son Gary was born on October 10, 1943, and in April 1944 First Lieutenant Bissonnette left the United States for overseas duty in India, with the 88th Fighter Squadron of the 80th Fighter Group. As part of the Tenth Air Force, the 80th Fighter Group was a vital element in the victory in Burma. During its two years in combat in the China-Burma-India (CBI) Theater, this group, which called itself the Burma Banshees, flew patrols in support of the cargo airlift over "the Hump" between Assam, India and Kunming, China. The 80th also provided offensive strikes in the Huwang Valley of northern Burma to protect allied engineers building the Ledo Road, a land supply route through the Burmese Jungle. The duties of the group were later extended to include offensive strikes in northern Burma to prevent the establishment of enemy bases from which Allied planes might be attacked. But Japanese opposition was not the only enemy. In the dense jungles temperatures could reach 140 degrees Fahrenheit with humidity hovering near 100 percent. Crews had to work amidst swarms of beetles and flies, and sleep beneath mosquito netting. Disease hospitalized more men than opposing enemy fire. Bissonnette flew a Curtiss P-40 Warhawk fighter plane with the group's distinctive death's head skull painted on each side of the engine cowling. In addition to escorting bomber forces into and out of Burma, Bissonnette flew fighter sweeps on Japanese air bases. In June 1944, the 80th Fighter Group began the conversion from P-40s to the Republic P-47 Thunderbolt, the largest single-engined fighter of its day. By July, Bissonnette was operating from bases in Assam, India, attacking Japanese forces in the Bhamo, Loiwing and Lashio areas, which had been unreachable with P-40s. "Lieutenant Keith Bissonnette, former infielder belonging to St. Paul ... has been awarded the Air Medal for distinguished service," announced The Sporting News in November 1944. Bissonnette flew over 200 missions, and also received the Distinguished Flying Cross with one oak leaf cluster plus three oak leaf clusters to go with the Air Medal. On March 28, 1945 - two months after he learned Dorothy had given birth to a baby girl, Diane, and almost a year after he first arrived in the CBI - Bissonnette took off from the squadron's airfield at Myitkyina, Burma, and never returned. Flying into central Burma, Bissonnette was attacking Japanese troop concentrations and supply areas. He was killed when his P-47 crashed two miles southeast of Keng Tung, Burma, near the border with China. 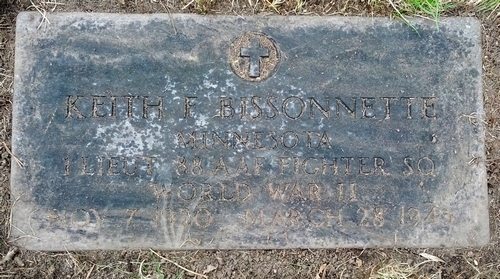 His body was returned to the United States after the war and rests at Calvary Cemetery in St. Paul. 1. Leesburg Commercial, May 31, 1940. 2. Bissonnette's plaque at the Cretin High School Athletic Hall of Fame. 3. Leesburg Commercial, April 19, 1940. 4. The Sporting News, February 18, 1943. 5. The Sporting News, November 23, 1944. Thanks to Erin Zolotukhin-Ridgway at the Saint Paul Public Library and Tim Benz, CFRE, Director of Development at Cretin-Derham Hall High School for help with this biography. Thanks also to Astrid van Erp for help with photos for this biography.